Remember the old saying "A dog is a man's best friend?" Growing up with 4 dogs, I have personally always found it natural to believe in that statement. But what about those who haven't got a good relationship with dogs? Now, it's true that some dogs are a bit scabby... loud smaller ones in particular =). But in general the fear of domestic dogs is an irrational emotion. Narrowing down the common reasons, I found that people who fear dogs live in a limiting belief. So, either they had a bad encounter with a dog, they knew of somebody who had, or, even worse, they were educated to distrust dogs. Fear is one of human's basic conditions. It helps us survive. But irrational fears are not inherent, they are learnt. So we can un-learn them! I am pretty sure the worst dog is less evil than most human beings. I am also sure that, if you are reading this now, you believe your fear is limiting and, whilst part of you would want to love dogs, another part feels helpless, stuck in some prejudice. 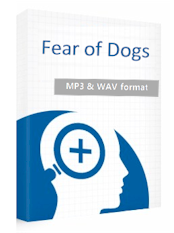 This album can help you wipe out the limiting beliefs you have and discover the immense satisfaction that could come from becoming a dog lover and, why not, even an owner.